On 14th May 2018 Baroness Cox responded in the HoL to Lord Crisp’s (crossbench) notion for greater Government investment in global nursing. In her speech, Caroling refers to two HART Partners, PAORINHER in Uganda and The Lady Cox Rehabilitation Centre in Nagorno-Karabakh, drawing attention to the brilliant dedication and ability of their staff. 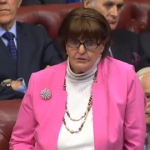 You can read Baroness Cox’s contribution and the whole debate here.